The Mohegan Tribal Gaming Authority (the “Authority”) is an instrumentality of the Mohegan Tribe of Indians of Connecticut, a federally recognized Indian tribe. The Mohegan Tribe has a 405-acre reservation in Uncasville, Connecticut, where the Authority has been granted an exclusive right to operate and regulate gaming activities on tribal lands. In October 1996, the Authority opened Mohegan Sun, a gaming and entertainment complex on 240 acres of the Tribe’s land. Over the past six years, Mohegan Sun has and continues to undergo a series of major expansions. The complex currently operates in an approximately 3 million square foot facility, which includes the “Casino of the Earth,” “Casino of the Sky,” “Shops at Mohegan Sun,” a 10,000-seat arena that is home to the Women’s National Basketball Association Connecticut Sun, a 1,200-room luxury hotel, a 350-seat Cabaret, and 100,000 square feet of convention space. Further expansion of the complex is underway currently with “Project Horizon,” an estimated $925 million renovation scheduled for completion in 2010. The Tribe’s operation of Mohegan Sun is one of only two legally authorized gaming operations in Connecticut. Through an Authority subsidiary, Downs Racing, LP, the Authority also owns and operates Mohegan Sun at Pocono Downs, a 400-acre harness racetrack and casino in Plains, Pennsylvania, as well as Pennsylvania off-track betting facilities in Carbondale, East Stroudsburg, Hazelton and Lehigh Valley. Harness racing has been conducted at Pocono Downs for more than 40 years. Downs Racing is the first harness track to offer slot machine gaming in Pennsylvania. Through an Authority subsidiary, Mohegan Golf, LLC, the Authority also owns and operates Mohegan Sun Country Club at Pautipaug, an 18-hole championship golf course located in southeastern Connecticut. The Tribe continues to pursue a diversification strategy of its business interests either through management or ownership of, or investment in, other gaming enterprises. In pursuit of that strategy, the Authority has obtained development and management agreements for a proposed casino to be built in Clark County, Washington by the Cowlitz Indian Tribe; development and management agreements for a proposed casino to be built in Kenosha, Wisconsin by the Menominee Indian Tribe; and is pursuing other gaming projects at Aqueduct Racetrack in Jamaica, New York and Wyandotte County, Kansas. The Senior Vice President of Legal Affairs will be responsible for all of the Authority’s legal matters and report to its Executive Vice President and Chief Operating Officer. The position will have two direct reports: the Vice President, General Counsel Mohegan Sun, who also has two lawyers on her team, and Vice President, General Counsel Mohegan Tribal Gaming Authority. The SVP of Legal Affairs will also supervise a paralegal/ administrator. – Selecting, monitoring and overseeing outside counsel. – Receptive to becoming proficient in Indian and liquor laws. – Is able to divine trends, adapt to changing and/or emerging situations, and handle an array of complex legal and business issues. The executive team is dynamic and seeks to function by consensus in running the business. Mitchell Grossinger Etess is Chief Executive Officer of the Authority, and President and Chief Executive Officer of Mohegan Sun. Mr. Etess joined Mohegan Sun as a member of the casino’s pre-opening team in 1996 as Senior Vice President of Marketing. Thereafter, Mr. Etess was promoted to Executive Vice President of Marketing and was responsible for marketing, food and beverage, sports and entertainment, and hotel operations. Mr. Etess was elevated to President and Chief Executive Officer of Mohegan Sun in 2004. Prior to his career at Mohegan Sun, Mr. Etess worked at Players Island Resort-Casino-Spa in Nevada, and at Trump Plaza Hotel & Casino in Atlantic City. As well, Mr. Etess worked in virtually every capacity at his family’s Grossinger’s Hotel in Grossinger, New York. Jeffrey Hartmann is Chief Operating Officer of the Authority, and Executive Vice President and Chief Operating Officer of Mohegan Sun. Mr. Hartmann came to Mohegan Sun in 1996 as Executive Vice President and Chief Financial Officer and was responsible for day-to-day accounting, financial reporting to the SEC and bondholder and banking relations. Mr. Hartmann was promoted to Executive Vice President and Chief Operating Officer in 2004. In that capacity, he oversees Mohegan Sun’s hotel operations. Prior to joining the Authority, Mr. Hartmann was Vice President of Finance for Foxwoods Management Company for five years. A Certified Public Accountant, Mr. Hartmann was employed by PricewaterhouseCoopers, LLP, as an Audit Manager for seven years before that. Leo Chupaska is the Authority’s Chief Financial Officer; he has held that position since 2004. Prior to that, Mr. Chupaska served as CFO of the Mohegan Tribe and was a member of the Financial Advisory Committee of the Authority’s Audit Committee. Prior to joining the Tribe, Mr. Chupaska served as Director of Financial Services for Lawrence and Memorial Hospital in New London, Connecticut. Compensation will consist of a generous base salary, depending upon the candidate’s experience. A discretionary bonus also is part of compensation which is based upon the Authority’s financial performance and other metrics. The village of Uncasville is part of Montville Township in New London County, Connecticut. Among other things, the county is a destination for travelers who are interested in historic maritime (Mystic Seaport). New London County also is home to the Stonington Winery, NASCAR racing at the Waterford Speedbowl, and Ocean Beach and Boardwalk for those interested in the beach. Waterfront property and excellent schools are within reasonable commuting distances to the resort. Congratulations to Dan Lewis (1L)! Congratulations to Dan Lewis (1L) for receiving two honors this month! Dan was selected as one of the four 2008 AAABA Thomas Tang Scholarship Award recipients and will receive a $2,000 scholarship. Dan was also named a 2008 Cohen Professionalism Scholar. See article below about the Cohen Scholars. 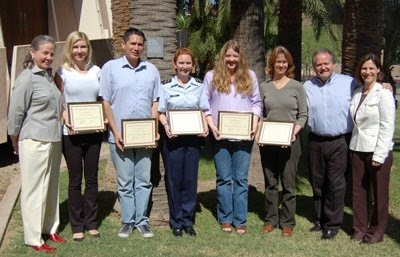 Posing with (far left) Dean Patricia White and (far right) Maricopa CountySuperior Court Bruce R. Cohen and Loren Cohen are the 2008 CohenProfessionalism Scholars at the Sandra Day O’Connor College of Law,(left to right) Amy M. Coughenour, Daniel A. Lewis, Meghan McCauley,Natalie Greaves and Alison Atwater. For their prize-winning essays abou tintegrity, the students received scholarship money from the Cohens andwill visit the Museum of Tolerance in Los Angeles this summer. “I started with values, But where did they go? How the error escaped me I never will know. I thought it was worth it To get where I was, But right has one reason, And that’s “Just because.” “So hand me that bucket, That mop and that pail. I must finish cleaning The floor of this jail. Congratulations to the 2008-2009 NALSA E-board! Description: The Confederated Tribes of the Colville Reservation seeks a licensed attorney with at least two to five years experience in Indian Law (five years preferred), including at least some legal work experience in the areas of education, health and human services, including Indian Child Welfare work, to join the staff of its Office of the Reservation Attorney (ORA). The Colville Reservation is headquartered in Nespelem, Washington and contains 1.4 million acres. The Colville Tribal government serves more than 9,000 enrolled members through a variety of health, social services, employment and education programs, to name a few. The attorney in this position would focus primarily on these and related issues, although all attorneys on staff have the opportunity to work on a variety of significant and interesting legal matters. Litigation experience in federal court is preferable but not required. This position provides a wide range of opportunities for professional growth and development in the increasingly-complex field of Indian Law. ORA is one of the oldest on-reservation tribal government law offices (established in 1981), with a tradition of excellence. Applicants must be admitted to practice before the Washington State Courts upon hire or within two years of hire. Exceptionally strong research and writing skills are required. The position provides a competitive salary, beginning at more than $68,000.00 annually for attorneys with two years? experience, with annual increases thereafter, and generous health and retirement benefits. The position is open until filled. Please submit cover letter, resume listing at least three references, and writing sample to Alice Koskela, Managing Attorney, Office of the Reservation Attorney, P.O. Box 150, Nespelem, WA 99155. Description: The Confederated Tribes of the Colville Reservation seeks an attorney with particular experience and expertise in natural resources law and Indian Law, having at least 5 years experience as a licensed attorney, to work in its Office of the Reservation Attorney (ORA). The Colville Reservation, with headquarters in Nespelem, WA., contains 1.4 million acres and provides its attorneys the opportunity to work on significant natural resources and water law issues, among other areas, and to become engaged in a variety of interesting and important legal matters. ORA is one of the oldest on-reservation tribal government law offices (established in 1981), with a strong tradition of excellence. Applicants must be admitted to practice before the WA State Courts upon hire or within two years of hire. Applicants should have extensive civil litigation experience in federal courts and be able to perform all litigation tasks. Exceptionally strong research and writing skills are required. Otherwise strongly qualified applicants with less litigation experience will be considered. Salary DOE. Generous health and retirement benefits are provided. The position is open until filled. Please submit cover letter, r?sum? listing at least three references, and writing sample to Alice Koskela, Managing Attorney, Office of the Reservation Attorney, P.O. Box 150, Nespelem, WA 99155. ORA is an Indian Preference employer, and Native American attorneys are encouraged to apply. Staff attorneys will work with Indian individuals, families, organizations and tribal governments in all areas of Federal Indian law, including but not limited to, advising on issues involving jurisdiction, tax, estate planning, trust assets, environmental law, natural resource development, tribal governance, employment, and the Indian Child Welfare Act. Responsibilities may range from the provision of brief counsel and services to low income Indian individuals to representing individuals and tribes in state and federal court, negotiating contracts, advising tribal clients and developing and implementing constitutions, codes, and policies for tribal clients. California Indian Legal Services is a statewide, tribally controlled, non-profit corporation that provides legal services to Indians, Indian tribes, and Indian organizations on issues involving Federal Indian Law. CILS attorney services range from providing brief counsel and advice to low income Native Americans, to more extended representation on core legal issues affecting Native Americans and Indian tribes, to significant litigation, policy analysis and advocacy, to transactional services to tribes involving economic development and tribal infrastructure. Currently, CILS operates five offices in California. 8:50 a.m. to 12:00 p.m.
Events worldwide have increased pressure, and created more opportunity, for energy projects. Tribal governments locally and across the country have been engaged in mining, energy transmission and energy generation. Tribal economic development will lead to additional Tribal utilities and energy production from renewable resources. This seminar will provide an overview of the myriad issues practitioners face when assisting a tribal government with an energy project. Presenters will examine financing issues, the tribal, federal and state laws and regulations that affect tribal energy projects, and ethical considerations when working with third party developers and various branches of tribal governments. There will also be a discussion of the transition from a BIA utility to a tribal utility. Sarah Cedarface placed 2nd in the statewide Judge Thomas Tang Writing Competition. Her essay “Social Change and the Presidency” analogized the US policy changes on the Pine Ridge Reservation with the national/societal improvement needed for a minority to win the US presidency. It was the top finisher from ASU. Congratulations Sarah!